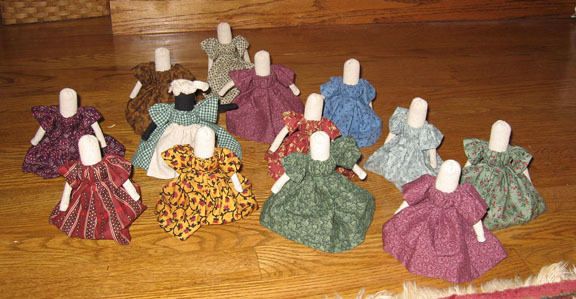 The picture shows a group of rolled fabric dolls which are typical of the finished rolled fabric dolls. They are each about 4 1/2 inches tall. So now, even if you feel challenged by the task of making your own doll from a kit, you can enjoy having a rolled fabric doll of your own. Because the dresses were made with scraps, we can't guarantee that we will have any of these dress patterns in stock at any given time. However, if you'd like to express a first, second, third, or more preferences for colors, we'll do our best to match your request. But, if we don't have your preference in stock, we will choose a doll at random. Be sure and read a bit about the history of these dolls on the previous page about the Rolled Fabric Doll Kit. And be sure and name your doll. We have not pre-named them because you may have some special name to give them. Also, note that one of the dolls is made with black material. For more about her, go to the next page, which is devoted to the Black Rolled Fabric Doll. Each of these finished dolls (with the exception of the black doll) is $13.50. See the next page down for the black doll.